I promised you the insider tips from MATKA Nordic Travel Fair 2017, so here they come! The most exciting experience in MATKA fair was in Kaarina planetarium’s stand the HTC Vive experience. HTC Vive allows you to play a game with VR glasses and controllers. The idea of the game I played was about a spaceship that you try successfully to land on the moon on a marked spot. The beginning was exciting when I saw the spaceship next to me and I was going down towards the ground. In the game I was sitting in the cockpit of the spacecraft and saw the Earth from space. That was cool. The main point was to succesfully land on the moon on the marked spot with the spacecraft. With my skills that was impossible but I got points from the guy presenting the game for having the best style. The best style was that I got the whole spaceship spinning 360 degrees that I almost felt sick. What an experience! I recommend for all of you to try VR glasses! It’s such an intensive feeling when you can see everything 360 even though you are in a game. At MATKA fair you can try them with Kaarina planetarium, Aurinkomatkat or Finnair among others. Get crazy in the photo booth! Have the best laugh with your friend at MATKA fair and try the Air Baltic’s photo booth! You will have different acessories to wear and you have a few seconds of time to change them for every photo. There will be a few photos taken and you will get a collection of them with you. Eckerö Line had the similar idea of a photobooth. That looked fun too! Ropes and pieces of wood made for climbing, sounds exciting? If you are not too scared of heights climb up and see the MATKA fair from different perspective. Challenging but definitely fun! In Thailand’s department you can learn how to make Loi Krathong flower baskets. Loi Krathong “festival of lights” is an important festival held every year. The dates depend on the lunar calendar and they vary every year. The important symbol of Loi Krathong are flower baskets that are sent to the sea or other water element on the full moon while the people make wishes and prayers. Beautiful way to learn about Thai culture! Aurinkomatkat has a swing in their department in front of a picture from paradise. Swing yourself to victory and take photo while swinging there. They have a competition related to the swing but I just love swings in general. Coming to MATKA fair with kids? Check out the ball pool (pallomeri) next to Viking Line! It’s meant for kids under 12 years. Right next to the swing of Aurinkomatkat you can play on the sand with shovels. 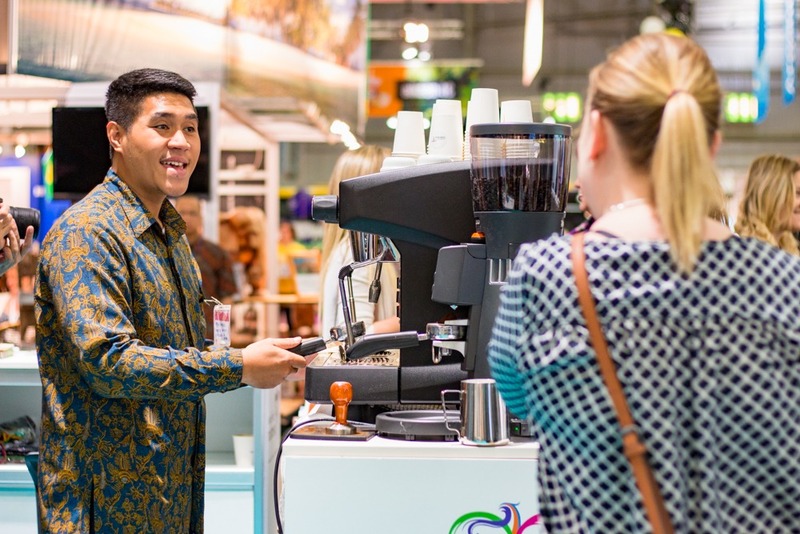 If you need a bit of a recharge go and get some Indonesian coffee from the department of Indonesia! It definitely helps!